Midnight Line, Lee Child’s previous Jack Reacher novel, was a page-turner, but it left me wondering whether Reacher was getting a bit old for all the action Child put him through. I gave it a four-star review, but to be honest, I promised myself I would give Child only one more chance to keep my interest in Reacher. Past Tense kept my interest. The novel has three storylines. One, Reacher finds himself in Laconia, New Hampshire, where his dad was born and raised. The only problem? There’s little trace of Stan Reacher there. Two, while searching for records of his dad, Reacher beats up a man bullying a woman. Unfortunately, the man is connected to bad actors who come to Laconia looking to settle a score. Three, a Canadian couple find themselves stranded at a remote motel where the owner and his business partners act more than a little strange. The owner’s last name? Reacher. This isn’t the best of the Reacher novels. However, it’s good enough to keep me interested through next year when, come fall, I’m sure Child will publish Reacher’s next adventure. I hope it’s set in San Diego. That’s where Reacher is heading, and lots of interesting happens in San Diego, or could happen, if Reacher were there. Lee Child, Past Tense: A Jack Reacher Novel (New York: Delacorte Press, 2018). P.S. If you found my review helpful, please vote “Helpful” on my Amazon.com review page. Y Is for Yesterday is the 25th installment in Sue Grafton’s long-running Kinsey Millhone Alphabet Series. Kinsey is asked to investigate the blackmail of a young man just released from juvenile detention for a homicide he committed a decade earlier. As she begins to question family and friends, she uncovers a web of secrets and lies that lead to murder. I first heard of the Kinsey Millhone mysteries while living and working in Santa Barbara, California more than ten years ago. Santa Teresa—where Kinsey lives and works as a private investigator—is a lightly fictionalized Santa Barbara, so it was easy for me to imagine her pounding the pavement in search of justice, or at least answers. I started with A Is for Alibi, got hooked instantly, and have since worked my way through the alphabet one letter at a time. It’s hard to believe that Sue Grafton has been at this series since 1982, when A Is for Alibi was published, but I’m glad she’s persisted. This book is a page-turner, and I look forward to reading Z Is for Zero in 2019. Sue Grafton, Y Is for Yesterday (New York: G. Putnam’s Sons, 2017). A Murder of Quality is John Le Carré’s second novel as well as the second (of seven) in which ex-spook George Smiley plays a role. When the wife of a tutor at a prestigious public school is murdered, a friend of Smiley’s asks him to look into the case. Smiley’s attention—and everyone else’s, including the reader’s—is focused on a suspect until the very end when the truth comes out. Le Carré describes A Murder of Quality as “a flawed thriller redeemed by ferocious and quite funny social comment” in the Introduction to this edition, and the book is that, although I wouldn’t say it is fully redeemed. P.S. John Le Carré, A Murder of Quality: A George Smiley Novel (New York: Penguin, 2012; orig. 1962). 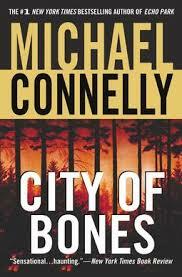 City of Bones is the eighth installment in Michael Connelly’s series of novels featuring Los Angeles homicide detective Harry Bosch. It opens on New Years Day, when Bosch is called to a home in Laurel Canyon. A dog has found a bone, and its owner, a medical doctor, is certain that it’s human. Bosch begins to investigate and unearths the majority of a skeleton. Forensic examination reveals that the body belonged to a young male who had suffered physical abuse throughout his short life. Within days, Bosch knows the name of the victim, Arthur Delacroix, and the year of his murder, 1980. But who killed him, and why? Connelly leads readers through Bosch’s 13-day investigation with storytelling skill, leading us down investigative rabbit trails, only to corner the killer in the last pages of the book. In addition to the identity of the killer, those 13 days uncover secrets that destroy lives and families and threaten to end Bosch’s career. I was familiar with the plot of City of Bones before reading it. This book, along with Concrete Blonde, is the textual basis of the first season of Amazon’s Bosch series. The TV series took quite a few liberties with Concrete Blonde, but it hewed closely to the narrative of City of Bones, with a few, important exceptions. Still, it is a testament to Connelly’s storytelling skill that he captured my attention through the book despite the fact that I knew who the killer was all along. I’ve reviewed a number of books in Connelly’s Harry Bosch series, together with books in his Mickey Halley and Terry McCaleb series. With one exception, I think each of them is well crafted and engaging. As a guy who likes to read mystery series featuring a lead character and returning cast of characters, I thoroughly enjoy Michael Connelly’s books and recommend them to people with similar tastes to mine. Read the books in order, though. Each mystery is self-contained, but the character arc of Harry Bosch is worth making the time and effort to start from The Black Echo and work your way forward.